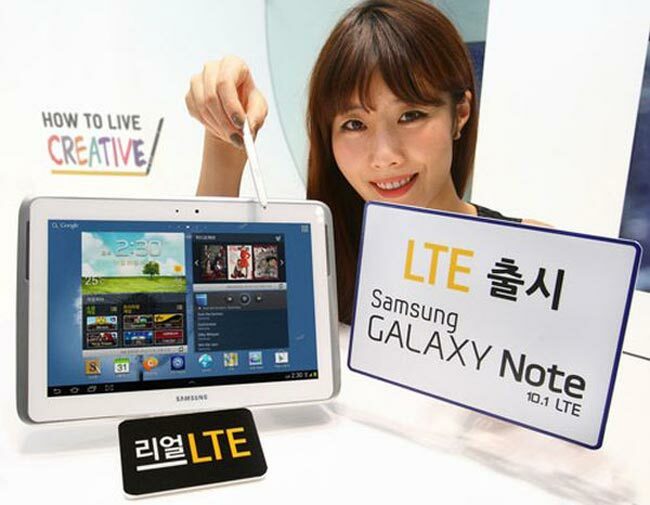 Samsung has launched a new version of their Galaxy Note 10.1 in South Korea, the Samsung Galaxy Note 10.1 LTE which comes with Android 4.1 Jelly Bean and it will be available with the major carriers on South Korea. The Samsung Galaxy Tab 10.1 LTE comes with VoLTE support and features a 10.1 inch inch display with a resolution of 1280 x 800 pixels and it is powered by a quad core 1.4GHz Exynos 4412 processor. Other specifications on the Samsung Galaxy note 10.1 LTE include dual cameras with a front facing 1.9 megapixel camera for video chat and a rear facing 5 megapixel camera for photos and video. There is also a choice of between 16GB and 64GB of built in storage, and it comes with 2GB of RAM and a microSD card slot, plus Bluetooth 4.0 and a 7,000 mAh battery, it is expected to be released in the US some time before the end of the year.